WE STILL HAVE SPACE AVAILABLE FOR OUR CAMPS AT SUFFIELD ACADEMY! Print our 2019 Basketball World Day Camp application (8.5"x11"). View our 2019 Basketball World Day Camp brochure (8.5"x14"). Each camper must provide a medical certificate prior to attending camp. documented parental and authorized prescriber's (doctor's) permission. View Basketball World photos on our Facebook page! Day Camp Ages: Ages 8 - 18. Day Camp Cost: $315. Family rates and team rates available! Day Camp Time: Monday through Friday, 9am - 4pm. Special Note: Day Campers should bring a bag lunch. The camp will provide a drink for each camper. Suggested Clothing: Basketball sneakers, socks, t-shirt, gym shorts. Swimsuit and towel. Awards: Trophies are awarded in each league for the following: Free Throw, Shoot-out, Playmaker, Hustle, Defense, Rebounder, Most Improved, Playoff Champions, and MVP. These awards, plus the Outstanding Camper Award, are presented at our traditional award ceremony on the final day at 3pm. The Ceremony is a highlight of camp. 47 years experience conducting basketball camps! Under the direction of NBA scouts. Limited enrollment for personal interaction with coaches. One staff member for every eight campers. Individual instruction during daily teaching stations. Campers coached by a high school coach or college player. Campers compete against players their own age and ability. Campers play at least one half of every game. Campers receive a personal evaluation of their skills. Campers learn the latest breakthrough techniques of goal setting, visualization, and positive self-talk which will enhance performance, confidence, and self esteem. Parents are encouraged to attend camp at any time! Campers receive a FREE BASKETBALL WORLD T-SHIRT! FAMILY RATES & TEAM RATES available! 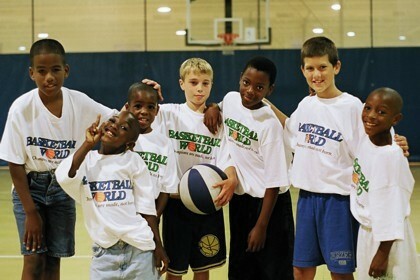 E-mail BASKETBALL WORLD to be added to our mailing list or to have a day camp conducted at your site! In your e-mail, include your name and street address.